Packing Size: 4.92" x 33.86" x 4.92"
Are you looking for an affordable display banner stands to promote your business and/or your products? 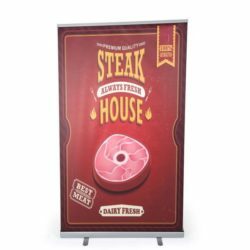 This low cost portable trade show display provides you the most effective value for money solution of exhibiting large signs. 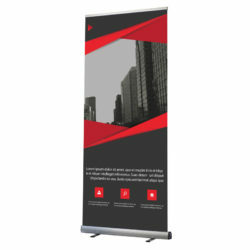 Trade show exhibitors, retail stores and convention centers favor such portable displays to improve their ad’ s visibility. 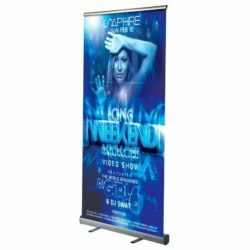 Also known as retractable roller banners, this portable trade show display is an ideal choice for your 33-1/2″ wide vinyl banners. Installing these pull up stands is a very simple process and takes only a couple of minutes to complete. 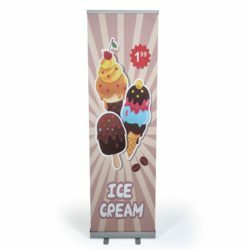 These roller pull up stands have an adhesive strip along a plastic sheet inside the base. Your banner connects to the tape, and then is placed inside the hinged clamp at the top of the unit. Once installed, you can not replace the graphic with a new one. 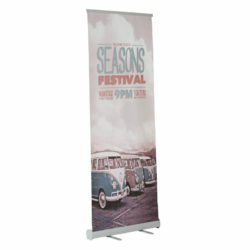 This portable trade show display is single-sided and exhibits only one single vinyl graphic. A custom vinyl graphic is not included. It has it’s fabric carry bag. 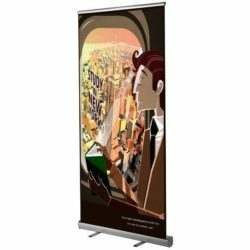 These banner stands are exactly what I was looking for. We used for a trade show the last week. worked great!